Mayumi v4 modchips aren’t quite as popular as MM3 chips, but may potentially be a better option for most systems. They aren’t compatible with older PS1 models, but are compatible with systems starting with the SCPH-5000 (PU-18 and later board revisions). They can be made using PIC12C508A chips. 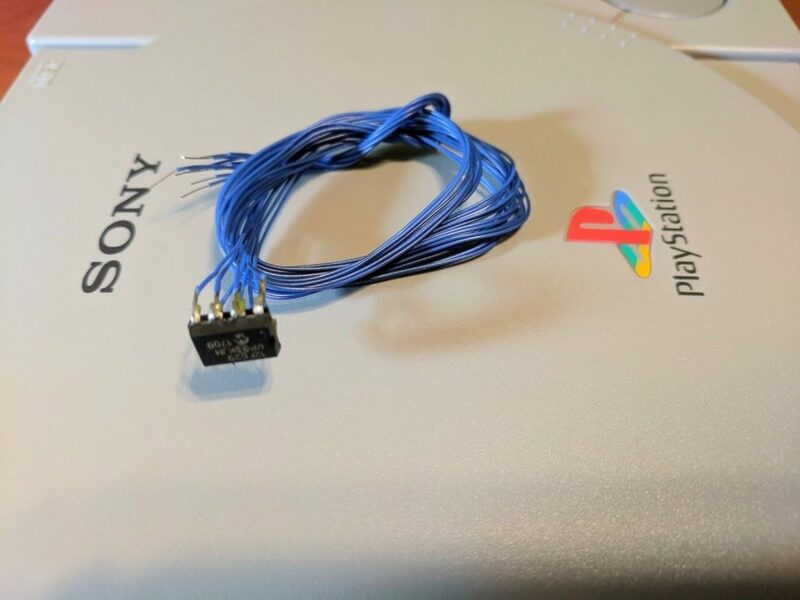 This guide covers everything you need to know about choosing, programming, and installing a Mayumi v4 modchip into your PlayStation. This page covers the Mayumi v4 modchip. It includes general information about the chip, and then links off to installation guides for each console model. Once you know what board you have you can click on the board model and you’ll be sent to a page with the installation diagram (if the board is compatible). There are a couple of downsides to using a Mayumi v4. First of all it isn’t compatible with every PlayStation 1 model, so if you have an older console you’ll need another chip. Mayumi v1.1 chips are compatible with those older PU-7 and PU-8 boards, I’ll be making a guide for those chips in the future. Another small downside with the Mayumi v4 is that it typically involves installing more wires than other chips like the MM3. In particular for most PS1 models pin 2 isn’t required, but it is for the Mayumi v4. Since this is the clock pin for the chip, it’s very susceptible to interference which can make it a trickier chip to install. I’ve also noticed that there is much less information about Mayumi chips online, and fewer places to buy the chips. This guide aims to solve the information problem once complete. The Mayumi v4’s greatest strength is its reliability. Because the Mayumi v4 uses the timing coming off of the PlayStation 1’s board, instead of the internal PIC oscillator (like the MM3 uses) it can boot games more reliably. A Mayumi v4 chip is less likely to get out of sync with the console when booting, meaning that you won’t have to restart the console to boot. Of course this is only the case if pin 2 (the clock pin) is short and well routed (to prevent interference). The Mayumi v4 modchip can operate in several modes. Modes can be toggled by pressing and holding the reset button for at least two seconds. For the PU-22 and PU-23 there really isn’t any reason to switch modes. In the PU-18 and PU-20 switching the mode to disabled would be useful if you wanted to play a genuine anti-modchip game that doesn’t work in the default mode. If you’d like to program your own MM3 modchips you’ll need the source code. I have the compiled hex source code for the PIC12C508A. The Mayumi v4 chip has three different versions, one for each region. If you have an American system use the USA version, if you have a European system use the EUR version, and if you have a Japanese system use the JAP version. I’ll have a tutorial on how to program PIC chips in the future. All Mayumi v4 chips I sell are preprogrammed. I don’t sell Mayumi v4 modchips on eBay. Running the high speed clock line successfully was too difficult for many of my customers resulting in a lot of returns. I do still sell them on my own store on this website though. I currently only ship chips to the United States. If you’re located in another country I recommend trying to find a local seller since shipping costs can be expensive. I sell both premodded PS1’s, and Mayumi v4 modchip installation services on my eBay store, as well as my store on this website. Do you still make premodded systems? I live in Toronto Ontario Canada. I would want a premodded system delivered, e-transfer of funds would be ideal for me. Yeah, I can do that, but I’d have to buy a system first (you can let me know which model you’d prefer). Payment would be done through PayPal, $60 for the modded console, and then shipping on top of that. If you email me (liam@quade.co) we can work out the details. I’m sure I sound very dumb, but what exactly does the mod chip do? Allows you to play genuine games and backup copies of games from any region.